Eagle Lake Home w/ Lake Views & Trail Access! Pack for an adventure and head to this 4-bedroom, 2.5-bathroom vacation rental home in Eagle Lake. Well-appointed and featuring all the comforts and amenities of home, this property is ideal for a group of up to 10 guests. Situated in a private gated community, you'll enjoy ultimate relaxation and peace of mind. With a view of the lake, you won't be able to resist paddle boarding, kayaking, and swimming. You'll be close to trails for excellent hiking, mountain biking, and off road vehicles! As you enter the gated community and approach your new home-base, you'll be impressed with the privacy and solitude with no other homes in sight! 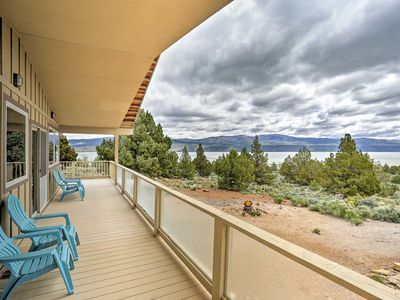 Mountain and lake views behind to home will instantly bring a smile to your face. Inside, the home is well-appointed with comfortable furnishings and tasteful decor throughout, including a large sectional sofa that's perfect for relaxing and enjoying the view! Returning after a hike, you'll look forward to stretching out as a movie plays on the flat-screen cable TV. As dinnertime approaches, head into the fully equipped kitchen to whip up a home-cooked meal that your whole group is sure to love. The kitchen features stainless steel appliances, ample counter space, and a breakfast bar. Share dinner at the charming rustic table, and be sure to pick the seat that looks out at the stunning view so you can catch the sunset over the mountains. Make your way to one of the 4 cozy bedrooms to rest up for the next adventure-filled day ahead. The 2 master bedrooms offer a view over the lake, while a queen bed and twin-over-twin bunk comfortably sleep 4 more guests. Additional guests have the option to provide their own air mattress, for a total of up to 10. Wake up to the sound of chirping birds and sit out on the back deck with a cup of coffee, overlooking the mountain range and enjoy the crisp, fresh air! You're in the right place for a rugged getaway at this Eagle Lake home. Situated just a half mile to the lake, you'll enjoy private access for paddleboarding or kayaking. The deep water boat launch is on the South side of the lake, about a 20-minute drive from the property. If you're in search of shallow fishing water, head to Spaulding just 10 minutes away. Just across the street, you'll find excellent trails for mountain biking, hiking, and off road vehicles. There are campgrounds on the South side of the lake as well! You'll be about 20 minutes away from the center of Susanville if you're in the mood for shopping and dining out. - Peaceful Susanville location just 20 minutes from town, 10 minutes from Spaulding, and a half mile from the lake!